Tamron announced today the release of Model DF010Q03, a P-iris vari-focal lens for integrated cameras supporting mega-pixel resolutions and infrared, with a 1/3″ imager size, 3.0-9.0mm focal length, and an F/1.2 aperture. The spread of mini-dome cameras and development of image sensors with higher pixel counts has led to a strong demand for higher definition in monitoring images. Existing lenses could not fine-tune the iris to match the environment, so image quality degradation due to diffraction at smaller aperture in bright areas was common. 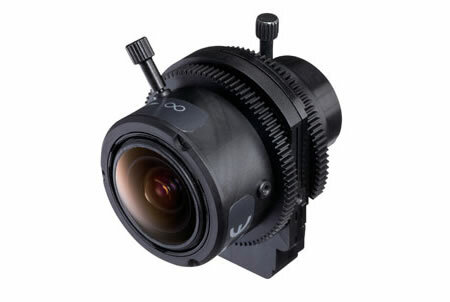 Tamron has addressed this issue with Model DF010Q03, a vari-focal lens with P-iris technology incorporating a bipolar drive stepper motor for fine-tuning the iris. This enhancement produces high-definition, high-contrast monitoring images in a broader range of camera installation environments. An infrared switching mechanism enables 24-hour surveillance, providing clear image quality even at night and near infrared lighting conditions, achieving true 24-hour surveillance. While maintaining resolution above a mega-pixel, the lens delivers a standard range of 3.0-9mm, and F/1.2 brightness. Tamron’s proprietary optical design achieves high resolution and high contrast not only in the center, but also at the image corners.